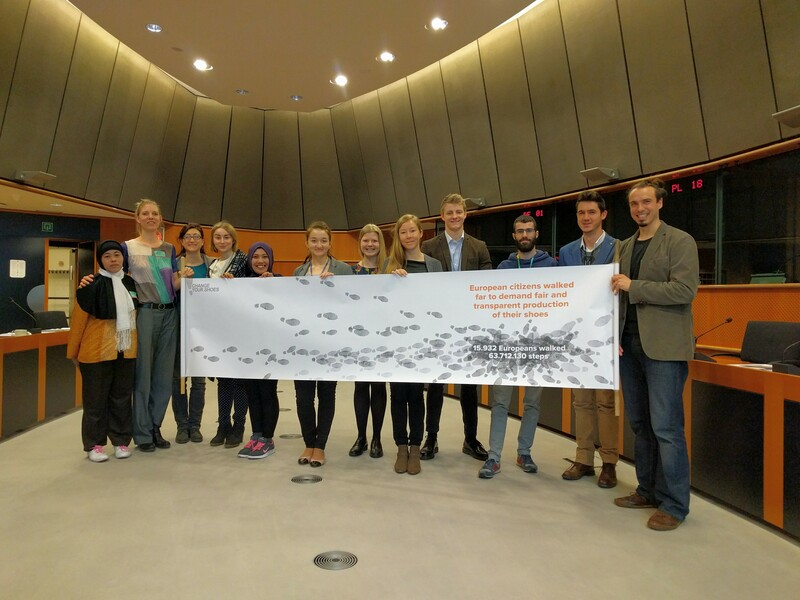 15 MEPs from different members states and political groups attended the Change Your Shoes meeting in Brussels. They were presented with the European citizens requirements: we want more transparency in the supply chains of shoe and leather industries, strict criteria for incoming goods and better information provided by labels on our shoes. These demands result from 12 open debates, the People’s Meetings, which took place in 12 European member states including London, England, as well as from the Virtual March to Brussels supported by 16.000 European citizens. Change Your Shoes raises awareness among citizens, brands and policy makers about the need to address the human and labour rights abuses in shoe and leather supply chains: low wages, excessive overtime, unsafe work environment and lack of true freedom of association is the everyday experience for thousands of workers producing our shoes. 24 billion pairs of shoes were produced worldwide in 2014. 88% of all this production comes from Asia. We need more transparency in the shoe supply chain: as people become aware of the low standards of working conditions in the shoe and garment industries arround the globe they come to realise there is not much we know about any specific t-shirt or pair of boots we are buying. It should be mandatory for EU based brands to publish their supply chains so that they could all be readily linked to conditions in specific factories. An EU-controlled label should mark that minimum social requirements are being met. We demand control of goods entering the EU: goods that enter the EU should be made with respect to human rights and and with fair working conditions. Social barriers should be set to goods trespassing the EU borders as a tool for improving conditions were they are made and trade agreements should reflect that. 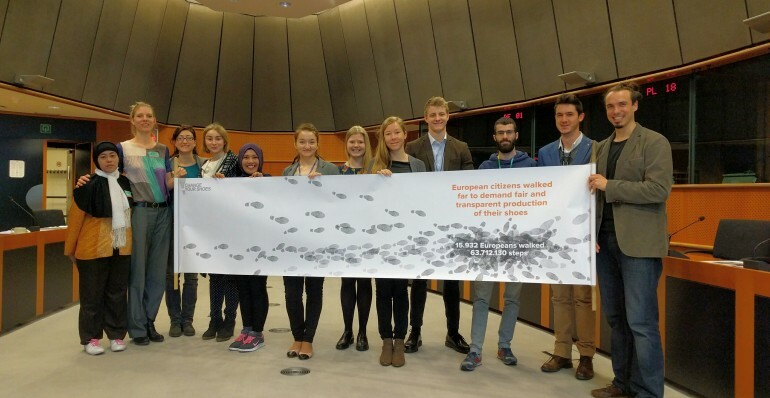 “We want the EU to introduce legislation to regulate the industry, protect workers and inform consumers in an easy and accessible way about the conditions under which their shoes were produced and the toxic content they may have”, states Ilana Winterstein, UK coordinator of the campaign Change Your Shoes. This demand for more transparency was supported by 16,000 citizens through a mobile application that counted their steps and added them in a Virtual March to Brussels. Together they collected over 63 million steps, although only 59 million were required to reach Brussels from 28 member state capital cities. Eci Ernawati, from the Trade Union Rights Center in Indonesia, also partner of the Change Your Shoes’ Consortium, explained to the MEPs the specific conditions of labour rights in her country where there is a lack of enforcement of labour law leaving workers without effective protection. Wanti, an Indonesian homeworker, brought her testimony of the conditions of her work. When she can work 10 hours a day she is paid about 800,000 rupia a month; the equivalent to approximately £43. According to Asia Floor Wage Alliance, the living wage in Indonesia is around £243, which means workers like Wanti remain trapped in a poverty cycle despite her long working hours. Homeworkers in Indonesia, as well as in other Asian contries, have no contract, no health insurance and no security of employment. Acording to Indonesian local governments, homeworkers are not even officially workers and have no right to join a union. “European brands should be aware of homeworkers conditions and take steps to protect their rights. Homeworkers are not always aware of those rights and have no bargaining power whatsoever in front of the factories they work for from home. They cannot protest because they would be easily replaced, but they need the money for their households” states Eci Ernawati, from the Trade Union Rights Center. MEPs that attended the meeting were moved and engaged in a fruitful dialogue with the consortium representatives about how they could promote better working conditions in shoe producer countries from the EU.